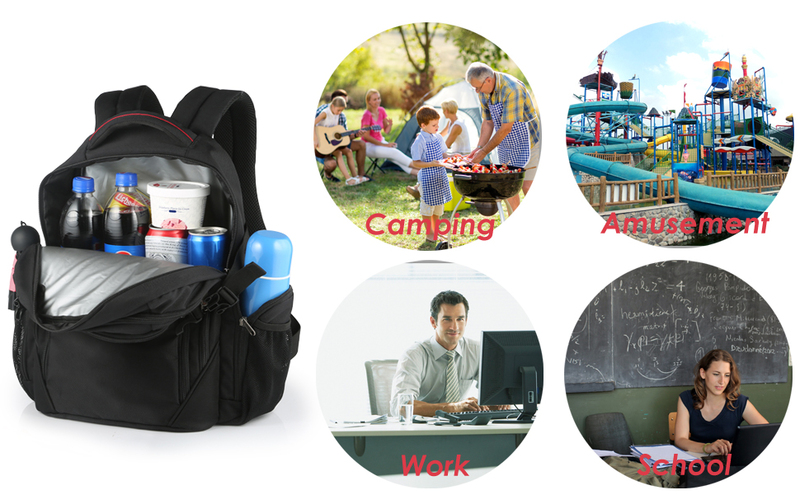 Carrying both a backpack and a cooler to work/school/outdoor is cumbersome and annoying. Now there’s an all-in-one solution. Take the OUTXE backpack cooler with you. Hands-free. No more lugging that cooler! Perfect for taking a road/beach trip, going picnicking, camping, hiking or enjoying other outdoor activities. The deep main storage compartment is large enough to provide roomy capacity for your meals, snacks, beers or other drinks, can hold at least 20 cans. One large zippered front pocket is big enough for a 14" laptop. With its adjustable padded backpack straps and thick padded back, breast strap, the OUTXE cooler pack is easy to transport when it's fully loaded with food and drinks. Made from rainproof tear-resistant, durable and lightweight Nylon. The food-grade PVEA liner is water-resistant and odor-resistant and easy to wipe clean. 1. Do NOT put ice directly into the cooler backpack to avoid cutting the leakproof material inside the bag. Use freezer packs to keep everything cool all day long. 2. Do NOT tilt or place the bag upside down to avoid letting water leaking through the zipper tape. OUTXE uses the Amazon Fulfillment Service (FBA) to make sure your order gets to you on time. Free Shipping on Orders over $29. For orders less than $29, a standard shipping fee is $5. Once you’ve placed an order, you will receive an Order Acknowledgement email to confirm your order details, including shipping and delivery estimates for each item. Once your item has prepared for shipment and ships, you will receive a Shipment Notification email with carrier and tracking information. If your order does not arrive within the indicated time frame, you may contact our customer service at hello@outxe.com to inquire about its status. Copyright © 2018, OUTXE. All Rights Reserved.